If you’re looking to seal bags and add codes simultaneously consider the solution from AT Information Products (AT Info). 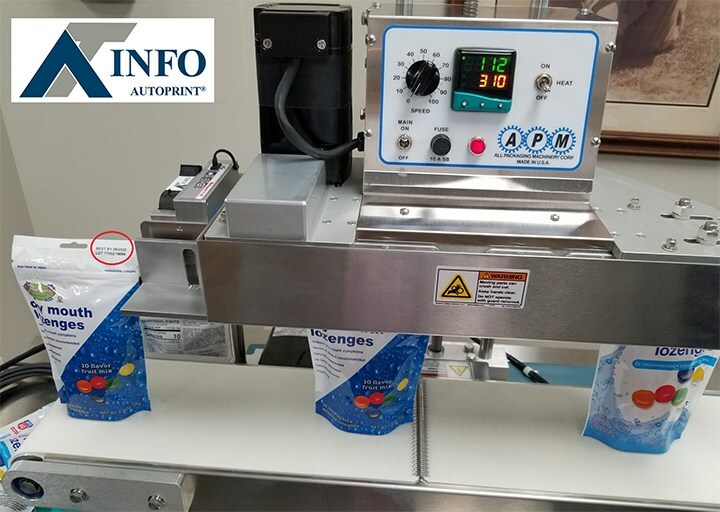 As shown, AT Info’s line of Markoprint industrial coders easily integrate with band sealers like those from All Packaging Machinery. Markoprint prints alphanumeric text, barcodes and graphics onto a wide variety of substrates used in Food and Consumer Goods. Quickly insert an AUTOPRINT solvent-based ink cartridge to provide best-by dates and lot numbers. Inks are available in black, red, blue, yellow, green, white and the all-new light blue. Print on virtually any flexible packaging material including PE, PP, Kraft/PE, Tyvek, Polymylar, Foil/PE and more. The sealer from All Packaging Machinery moves at speeds up to 35 feet per minute with synchronous motor drive package. Markoprint can code up to 90 feet per minute so speed is not an issue. For inquiries contact AT Info by calling (201) 529-0202, or see a LIVE demonstration at Pack Expo Chicago booth S-3300 in the South Hall.